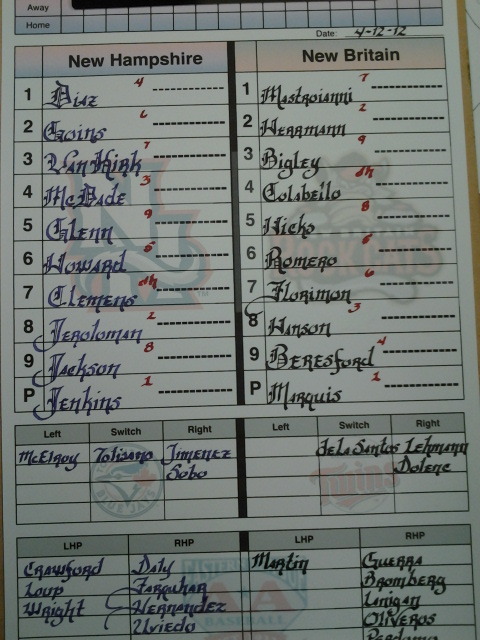 Sal Fasano's first lineup card at Northeast Delta Dental Stadium in 2012. "Your Gs have gotten better," I told him. Fisher Cats owner Art Solomon will say a few words and the 2011 Eastern League championship banner will be unfurled at the team's home opener Thursday night. NH went 3-3 on the trip to Trenton and Reading. A.J. Jimenez threw out 4 of 5 base stealers (I just hate saying "would-be base stealers") and picked off a runner. My story on A.J. here. Brad Glenn hammered the team's first homer of the season, and my 7-year-old old predicts Glenn will lead the Fisher Cats in HRs this season. It's Chad Jenkins vs. Jason Marquis in the lid-lifter at Northeast Delta Dental Stadium. NH manager Sal Fasano is the "Man Behind the Mustache," a great headline written by colleague C.J. McCarthy. "The first part of the year is always fun because you always feel like you have a chance to get kids better, get them to the big leagues and develop them the way you think they should be -- and hopefully win a championship at the end of the year. It's the best time of the year for me," Fasano said. Road Trip -- Three wins, two losses (so far). Brad Glenn cranked the first homer of the season for New Hampshire. Jonathan Diaz stole five bases, and Justin Jackson had a pair of extra-base hits. Mike McDade (.389) has taken the most Quality ABs. Prospects -- RHP Drew Hutchison retired 15 straight and during the course of two starts, winning at Trenton and Reading. The kid allowed two runs in his first inning of the season, then pitched 10 straight scoreless. "He got into a little bit of trouble in the first inning, and then went four straight innings and looked as good as he looked last year," manager Sal Fasano said. "He commands both sides of the plate. Hopefully he's only give a little taste of what we can expect down the road." RHP Deck McGuire pitched on a windy day in Trenton, elevated, and got teed up for eight runs at Trenton. 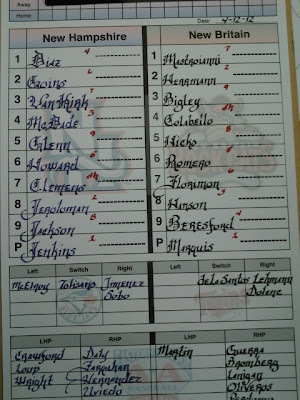 Catcher A.J. Jimenez has thrown out 3 of 4 base stealers and picked off a runner. And also impressed manager Sal Fasano with his blocking and receiving. "I'm trying to get used to the cold," Jimenez said, "but I'm feeling good about how I'm playing right now. (The Eastern League) is not easy, but it's not that hard, either." Defining Moment: Hutchison stranded the bases loaded in the fifth inning at Reading and kept the R-Phils scoreless through a career-high six innings at Double-A. Game story here. Hutch is now 5-0 in five career starts for NH.